When you spill some liquid on a carpeted floor, your primary concern is, naturally, the carpet. So you deal with the stain and run a fan to dry the carpeting. But have you thought about where that liquid goes after it soaks through the carpet and pad? Yep, the subfloor—the wood surface underneath the finished flooring. And while it may be no big deal if a tipsy party guest neglects to tell you about a spilled beer, a leaking fixture or appliance is a different story and can wreak havoc on floor structure. Dishwashers, toilets and bathing areas are among the worst offenders because leaks here can go unnoticed until it's too late. That's when you end up with serious water damage, which may not stop at the subflooring itself. "Subfloor" is a building term that's commonly misused, so first let's clear up any murkiness about this important part of your home's structure. A modern "stick-framed" house is a system of platforms. The first floor—if it's wood, not a concrete slab—is built atop the foundation walls. It consists of horizontal joists, typically 2x8 or larger framing lumber, topped with sheets of subflooring -- usually 5/8" or 3/4" plywood, OSB (oriented strandboard) or other sheet material. In old houses (roughly pre-WWII), subflooring commonly was 1" lumber boards running diagonally across the joists. The subfloor secures the tops of the joists and completes the structural plane that you walk on. Once the first floor's subflooring is down, homebuilders lay out and build the walls on top of the subfloor. If it's a multistory house, these walls are topped with the second-floor platform that's much like that of the first floor (in a single-story house, the ceiling joists and roof frame are next). 1. Subflooring is sandwiched between the joists and the walls' bottom plates. This means that wetness in the subflooring can wick to those critical framing members. 2. Subflooring is not the same thing as underlayment. Underlayment is a thin plywood or other sheet material laid on top of subflooring to create a smooth surface for thin flooring materials like vinyl and linoleum. Tile is set over an "underlayment" of cementboard, at least in newer homes built by quality contractors. Both wood underlayment and cementboard often are adhered to the subflooring, so if your underlayment is water-damaged, you'll probably have to replace the subflooring along with it. A limited or short-lived leak that's made it as far as the subfloor may not be a big problem, provided you can stop the leak, then dry out the subflooring and any neighboring elements (framing, floor and wall finishes, etc.) completely. Drying out is necessary to prevent mold and rot. Exposing the subflooring is the best way to dry it, but if this is impractical (maybe your kitchen sink drain has leaked and you don't want to remove the base cabinet, understandably), perhaps you can access the subfloor from below. To check the wall and/or floor framing, you may need to cut some holes in the drywall. 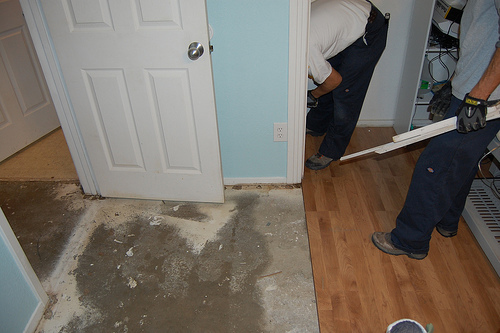 More extensive water damage often requires replacing the subflooring, and sometimes the framing and other affected materials, too. If the subfloor is spongy or there are any signs of mold or rot, you'll have to expose the subfloor and related elements beyond the area of damage. The subfloor then must be cut out and removed so you can examine the framing and let everything dry out. If the moisture has damaged any joists or wall studs or plates, or if the wetness goes under a wall, it's time to call in a pro. You need help from someone who understands the structural issues at hand and will resolve them completely before everything gets covered up with new subflooring and other materials. Because virtually everything in your house stands on the subflooring, it's highly impractical to replace the entire layer -- although this is often done with individual rooms during a major remodel or restoration work. Instead, subflooring can be patched in to replace just the damaged area. The key here is making sure all edges of the patch are properly supported. Cut back the subfloor so its edges "break" over the center of joists, or add solid-lumber blocking alongside (or spanning between) joists to create a structural backing and nailing surface. Subflooring can be a bear to remove, since it's often glued down with construction adhesive and fastened with special ring- or spiral-shank nails that really grip the wood. Panels are often tongue-and-groove to support the edges between joists. The patch can be the same material as the original or CDX plywood of the same thickness. Glue and nail the patch thoroughly to prevent a squeaky floor.